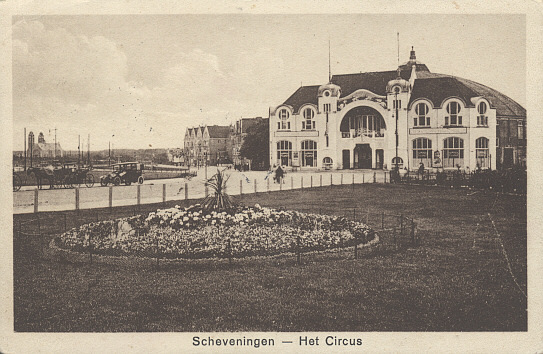 Built 1901-1904 by W. B. van Liefland as "Cirusgebouw" (circus building). 1965 converted to a theatre (1702 seats). Renamed "Circustheater". Re-opened 4 Oct 1966 with Beethoven's opera "Fidelio". 1993 concerted to a musical theatre by Arno Meijs (1793 seats). 1996 rebuilding for the musical production, "Miss Saigon". 2004 renamed "Fortis Circustheater". Later renamed "AFAS Circustheater". Used for musical performances, also used for opera performances and circus shows. 1813 seats (2006). 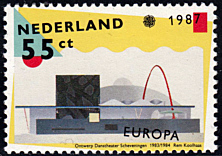 Front Text: "Scheveningen - Het Circus"
Front Text: "Ontwerp Danstheater Scheveningen 1983-1984 Rem Kohlhaas"